Is your landscape overgrown and needs a massive clean-up? Let the professionals help you redesign a low-maintenance landscape that will require the minimum time but still have the same beautification effect. Liberty Lawn & Landscaping can make your landscape go from a headache to an oasis of pure enjoyment. With over 13 years of experience and numerous certifications and licenses, Liberty Lawn can customize your landscape to your desires while maintaining the natural architect of the land and preserving the native plant life. 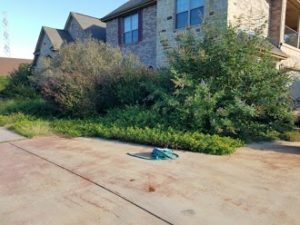 One of the best secrets to a low maintenance landscape is knowing the land and using Texas native plants that can withstand the harshness of Texas weather and soils. Many local nurseries sell native plants but also invasive or acidic loving plants. Here, in South Texas, our soils are filled with calcium limestone. This enriches the soil with an alkaline pH between 7.2 to 7.6, making plant choices a difficulty matter as most plants love a 6.7 to 6.9 soil pH. The idea of planting a low-maintenance landscape is choosing the right plants, rather that’s grass, perineal, or shade tree. Knowing what to plant versus what not to plant is Liberty Lawn & Landscaping expertise. Liberty Lawn can help you decide what plants to use to fit your ideas and any landscape theme. When landscapes become a nightmare to maintain, the materials utilized in the landscape can also be part of the problem. If weeds are a problem a commercial grade landscape cloth is needed to prevent weed germination from the ground. It is not a 100% weed-free barrier. However, it makes weed pulling and chemical applications go further than no barrier at all. If your landscape needs a fresh start, call Liberty Lawn & Landscaping and let us help with your landscape clean-up. We can turn that landscape frown upside down.